At Sage Hen Farm in Lodi, NY, we have planted many varieties of potatoes over the years, with the numbers and varieties changing each year, but these are varieties we have planted in recent years. Please note: we sell potatoes locally only (Ithaca, Trumansburg, and Lodi, NY), and, as we are not certified, we do not sell seed potatoes. Fingerlings: Often harvested earlier than their actual season to produce small finger-sized potatoes. See note on Uses for description of starch content. Note: starchy or not, all potatoes are gluten-free. average High resistance to late blight and scab. Rich, creamy flavor. They retain their color even as they are baked or fried, so when sliced, they can look like a pepperoni. high Low resistance to late blight and scab. Noted for rich flavor. Grows quite close to the surface, so hill well to prevent greening in sunlight. average Moderate resistance to scab. Noted for rich flavor. According to an old story, French fingerlings were smuggled into North America in a horse's nosebag. low High resistance to late blight. Noted for earthy flavor. Discovered on the Olympic Peninsula. Speculation is that the first Ozettes were brought there by Spanish explorers from Peru before 1600.
high Good resistance to scab. Skin darkens from light yellow to a golden yellow in storage. Flavor has been called nutty, earthily sweet, buttery, and also likened to mushrooms. average Good resistance to scab, high resistance to late blight foliage. A locally grown variety in one part of Peru. Once discovered, it took many years before it could be exported out of the country..
average High resistance to scab. Vwery low resistance to late blight foliage. Noted for very rich flavor. "Finn Apple" appears to be a corrupted translation of fir-cone, which is somewhat resembles. It has a loyal following, despite or because of its knobbly shape. See also Magic Molly in Blue/Purple. Did you know? The name "fingerling" was used because the size and shape of the potatoes resembled the small, young fish used by hatcheries for stocking ponds and streams, which in term were called fingerlings because of their resemblance to fingers. Because of fingerlings shape and size, they can be extra work in preparing, but their extra flavor and firm texture make them a first choice for roasting. They cook well when steamed or boiled, so they are also excellent for making potato salad. Moderate resistance to common scab and golden nemotode. 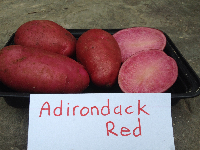 Developed at Cornell for its red flesh. Keeps color after cooking; turns pink when mashed. Moderate resistance to late blight and common scab. Noted for a special "gourmet" flavor. 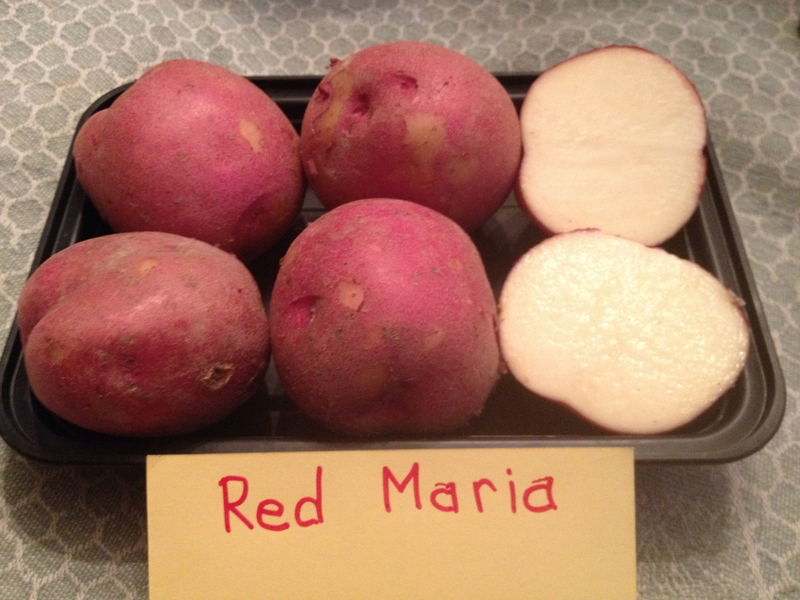 The most widely grown red potato in Europe. Low resistance to late blight. Good resistance to common scab. Noted for very rich flavor. 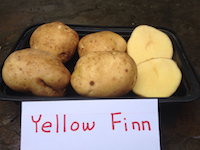 Grown widely throughout the British Isles; second most widely grown variety in Ireland. high Moderate resistance to common scab. Noted for rich flavor. Produces lots of small to medium tubers. Somewhat blight resistant. High resistance to common scab and golden nemotode. 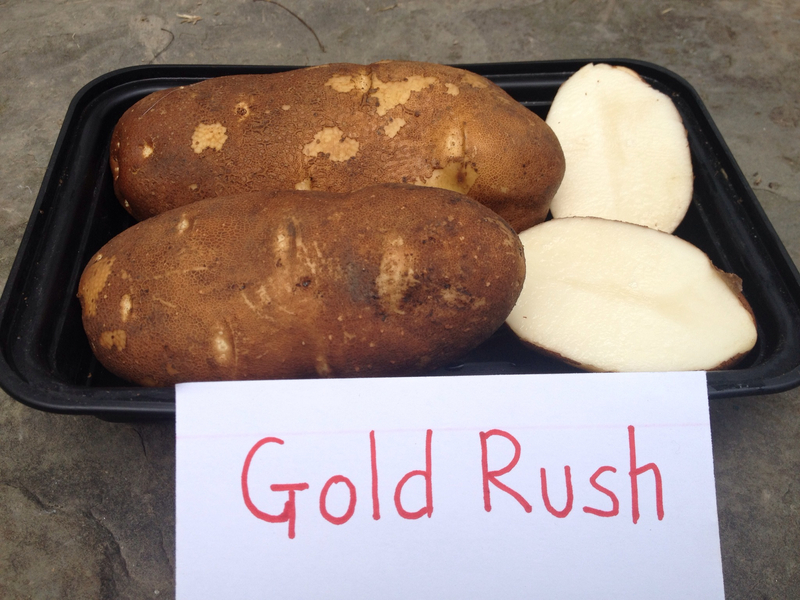 Developed at Cornell for blight resistance, high yield and uniformity of shape and size. Noted for rich flavor. Developed for its brillant red skin and brillant yellow flesh. The brillance, however, is variable. Our original supplier no longer sells this variety, so we've been trying to keep Romanze going on our own. Very recent Cornell release. Developed for blight and scab resistanceits plus an exceptionally dark red skin. Good flavor. Vigorous, but resistance to most diseases unknown. 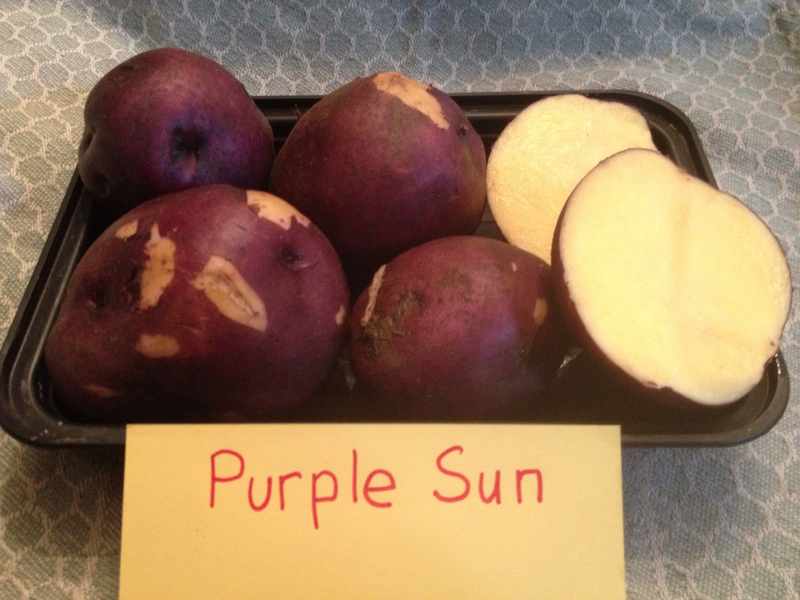 Developed in Alaska in the race for the deepest blue flesh and for a purple potato that keeps its color when boiled. Tuber size varies. Considered a fingerling by some. Good resistance to late blight; high resistance to common scab. Developed in Colorado State in the race for the deepest blue flesh. Low resistance to late blight; good resistance to common scab. 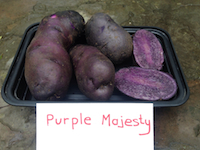 Developed for its beautifully textured deep purple skin over golden flesh. It was originally named for a professor of religion at Loyola University in Baltimore. Low resistance to late blight; high resistance to common scab. Mutant of the Viking, a red skin potato, which was developed in 1963. 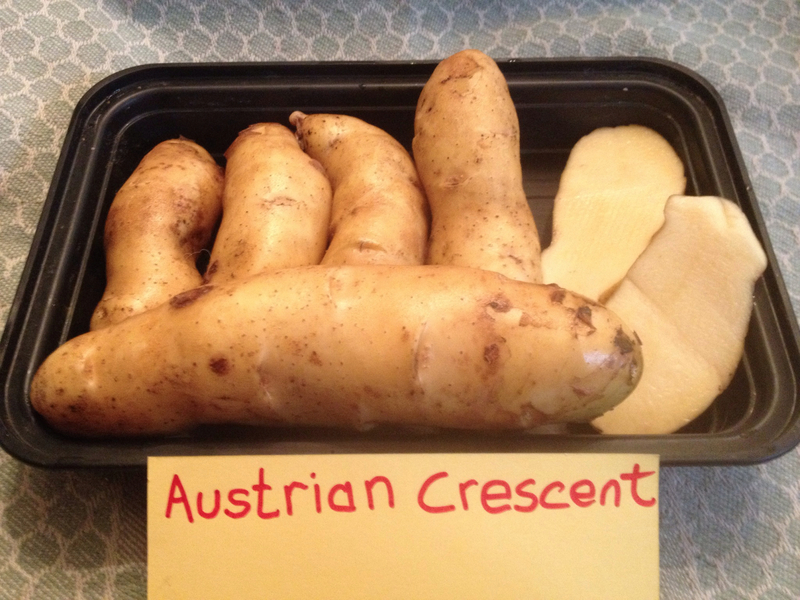 Known for producing only a few, but enormous tubers. Tends to sprout in storage. Did you know? The purple/blue color comes from polyphenols, specifically the anthocyanins, the same flavonoid that gives blueberries their color and gives both the same powerful antioxidant property. As a group, blue potatoes fit right in the middle between moist and dry, which puts them square in middle of the all-purpose category. Their color and bolder earthy flavor, however, make for special challenges or an opportunities. Some folks think blue mashed potatoes are the coolest thing, but others might not find them appealing at all. They stand up well with foods with fuller flavor and extra seasoning. 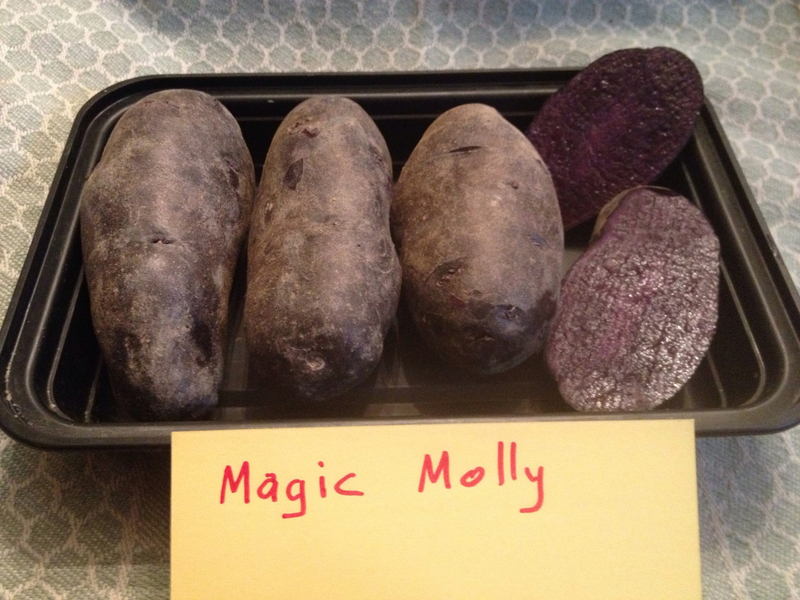 Many folks like to use them in combination with red and white potatoes, for a more colorful presentation. 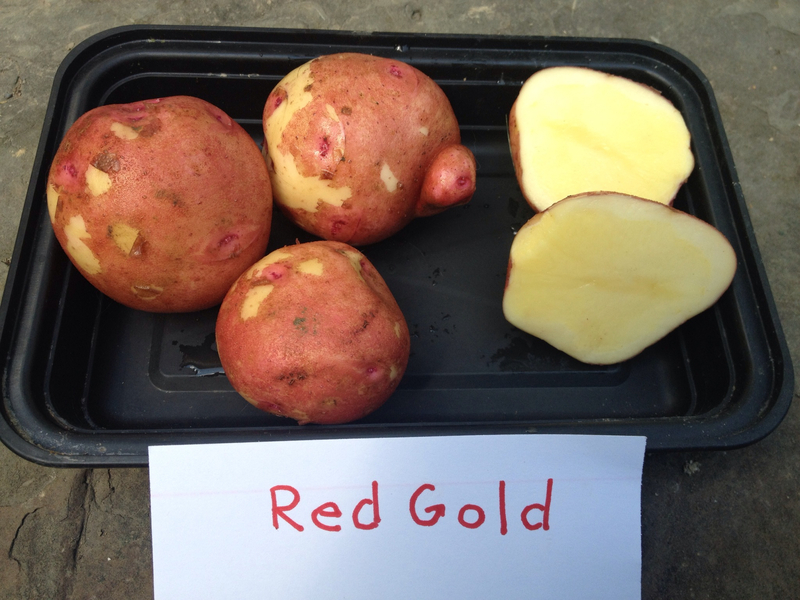 high Moderate resistance to late blight tubers; low resistance to late blight foliage; high resistance to scab. Noted for rich flavor. Grows quite close to the surface, so hill well to prevent greening in sunlight. 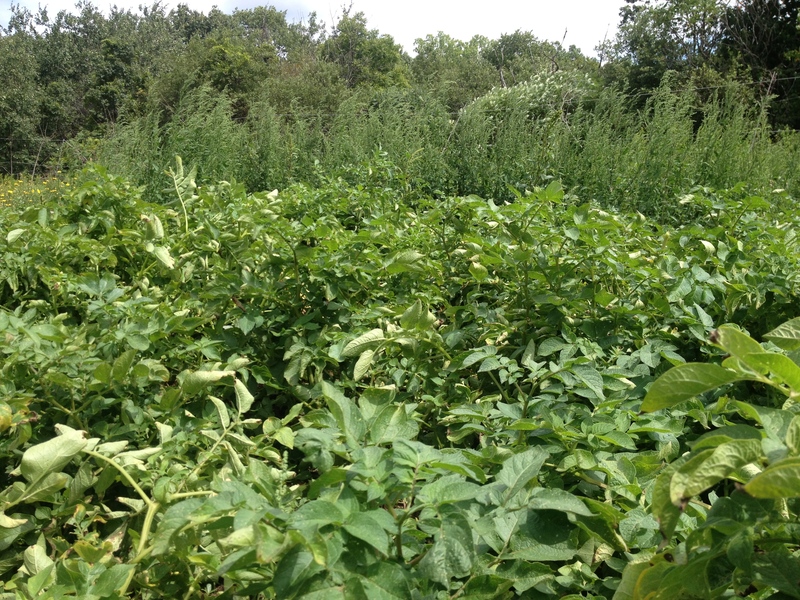 We've eaten potatoes from previous year's crop after we've started to harvest a new crop. Noted for rich flavor, and became THE potato for French fries in Europe (where they are called pomme frites), but because of high moisture but low starch, very versatile. Noted for rich flavor, ranked best flavored potato in taste tests from several sources. There are claims that it is a heirloom variety, and a German friend remembers a potato like the German Butterball when she was growing up, but its origin is hard to trace earlier than the 1980s. 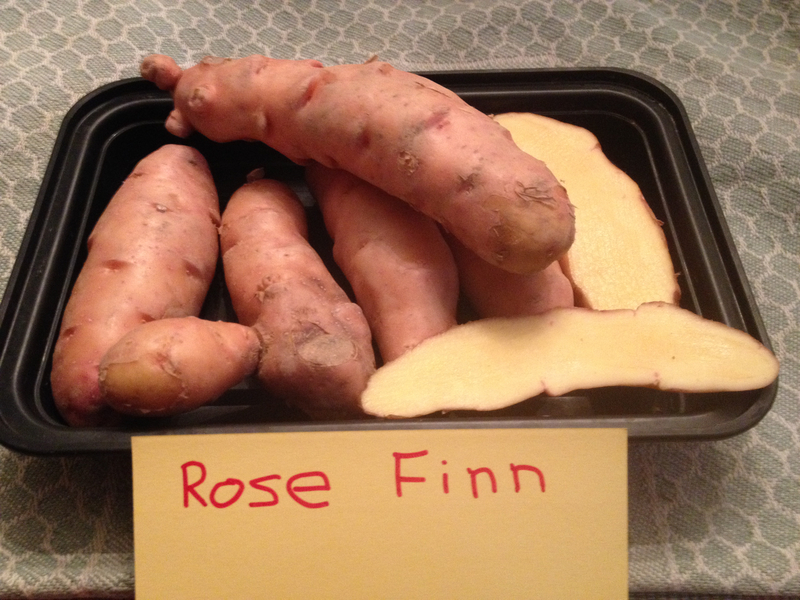 Known for developing many small tubers. average Good resistance to scab. Noted for rich flavor. Both France and the USA have been named as place of origin. It is an old enough cultivar that no one owns royalty rights. Expect a high percentage of small tubers. Did you know? The yellow flesh color comes from beta-carotene, lutein, and zeaxanthin, the same carotenoids that give egg yolks and corn their color and give them all the same powerful antioxidant property. 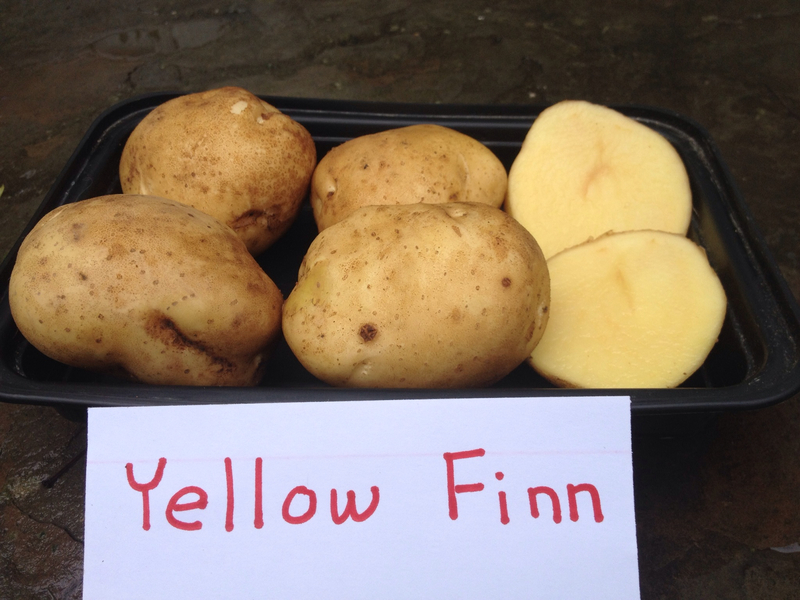 Yellows are potatoes with various shades of yellow flesh, from almost creamy white to almost the color of an egg yolk. 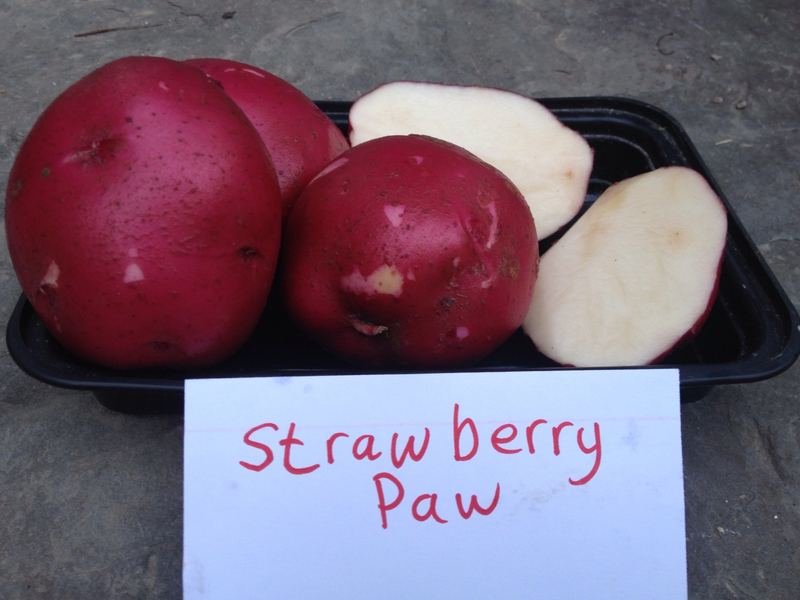 The extra color translates to being more nutritious and more flavorful than most white fleshed potatoes. Perhaps it is the power of suggestion, but "buttery" seems a common description for their taste. 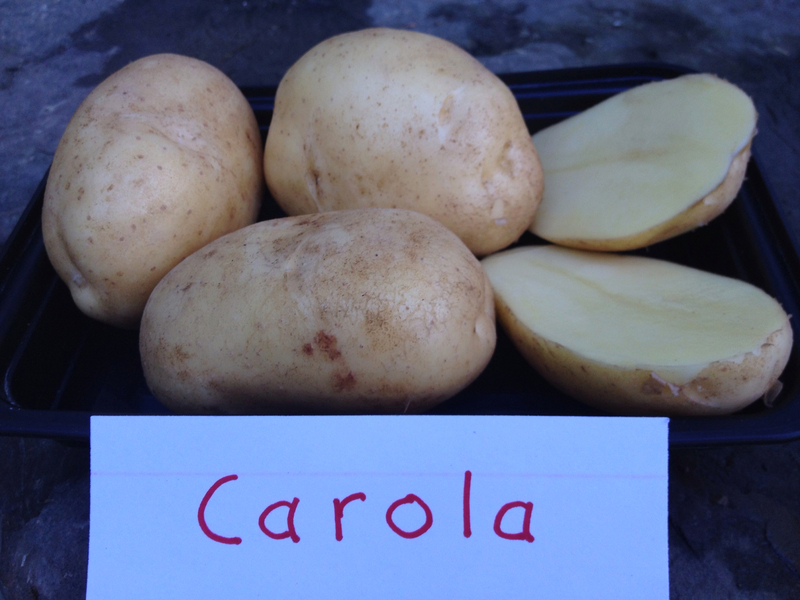 Carola and German Butterball have regularly won taste tests we have held in recent years. Resistance to early and late blight being tested. High resistance to hollow heart, rot, and scab. Developed to be a high-yielding russet with hollow heart resistance. Low resistance to early and late blight, and rot. High resistance to hollow heart and scab. Developed to improve on the Russet Burbank, especially in higher yield and better resistance to hollow heart . Not from Ohio. It has been credited with being the first potato grown specifically for baking, but it is not an especially starchy potato. We think it the most flavorful of white-fleshed potatoes. Moderately resistance to late blight. Low resistance to common scab. Known for its papery skin. Spuds can grow very large. 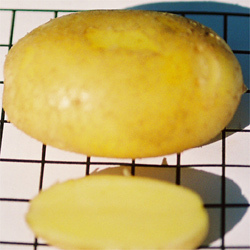 Once the most used potato for potato chips, but replaced by better storing potatoes with more uniform size. Did you know? White-fleshed potatoes are lower in sugar content than most other potatoes. This as much as the high starch content is what makes them excellent for frying, since higher levels of sugars can darken or even blacken pototoes. ue to their high starch content, are the first choice for baked potatoes. Low starch (waxy) stay firm and hold their shape well after cooking. Studies have shown that by content they are 13-15% starch. 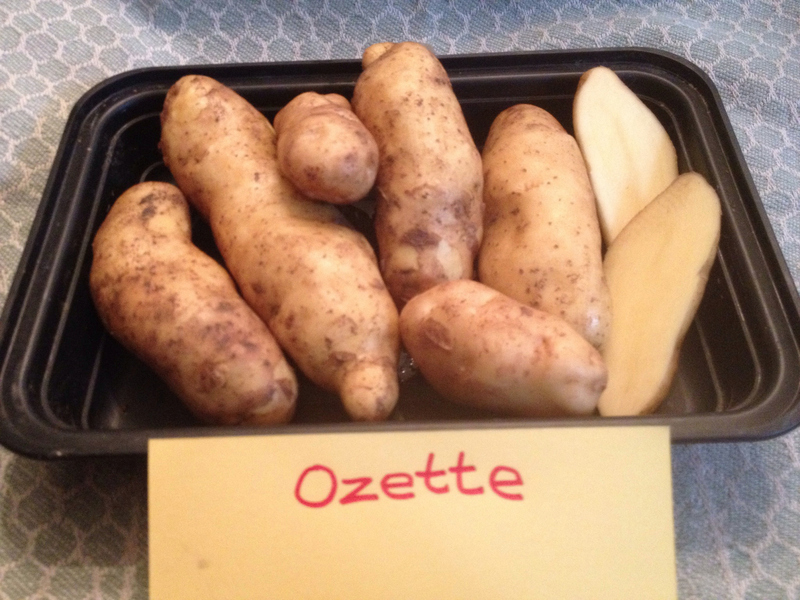 They are excellent boiled or roasted and the best potatoes to use for potato salad. Waxy potatoes can become too gluey for mashing and won't be fluffy when baked. Medium starch (moist) potatoes are versatile, all purpose potatoes (15-17% starch). Their moist, smooth texture make them great when cooked many different ways: boiled, steamed, mashed, roasted, and fried, and can also be used in potato salad or baked. Medium high starch (smooth) potatoes are also versatile, all purpose potatoes (17-20% starch). Their smooth texture make them great when cooked many different ways, but their texture makes them just right for potato chips and fries. Better than medium starch potatoes for baking and mashing. High starch (dry) potatoes have a light, mealy, fluffy, or floury texture when cooked, but do not hold their shape well (20-22% starch). Also called mealy or starchy. They are best for baking, mashing, and as fries. Potatoes from your garden or local farmers market will be more flavorful than the potatoes that you find in the super market. This is due in part to the varieties available, but also to how they are grown, and, in season, their freshness. Descriptions used to describe the tastes of different potato varieties are pretty limited, but within the range of "potatoey" are earthy, buttery, nutty, smooth, creamy, and sweet or almost sweet. In terms of amount of flavor, the potatoes above also range from mild (aka bland) to rich. How a potato is cooked and how it is served, however, will make a tremendous difference in how it tastes. Mashed potatoes loaded on with gravy won't allow much of the potato flavor to come through. Roasted or baked potatoes with little more than salt and pepper and butter will permit some varieties of potatoes to excel. Potato varieties have been assigned a category of early, mid, and late. Depending on where you live and what a particular season's growing conditions have been, the number of days will widely vary. Early varieties may be harvested between 55 and 80 days. Mid-season varieties can be harvested in between 70 days to 110 days. Late potatoes mature in a range from 100 days to 130 days or longer. Don't harvest by the calendar alone. With early potatoes, you can start pretty much as soon as they look large enough to eat. You will have to decide on the trade-off between the pleasure of new potatoes sooner and larger potatoes later. The plants themselves will be a good guide for the best time to harvest. Watch for the vines to die back, and then give them another week to so to start reaping the bounty. Especially for late varieties, you should wait as long as you can to allow the starch to be fully formed, both for flavor and better storage. So as long as the plant is alive and there is no frost warnings, let them grow. The potential to produce tubers ranked low, average, and high. There are too many variables for me to assign pounds and kilograms per plant. Some years, our high yielding potatoes have barely exceeded 4 lbs. (2 kg) per plant and other years have easily exceeded 10 lbs. (4.5 kg). 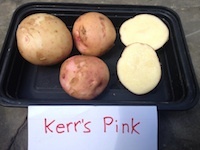 Some sources list the storage qualities of the different potato varieties, but in general, early varieties do not store as well as late varieties. A related factor is dormancy, meaning how likely the spuds are likely to sprout during storage. Only varieties with exceptional poor dormancy (most likely to sprout) are noted above. The range is very low, low, moderate, good, and high. I am uncertain how well most varieties have been tested, and for some varieties very different resistamce levels have been reported. 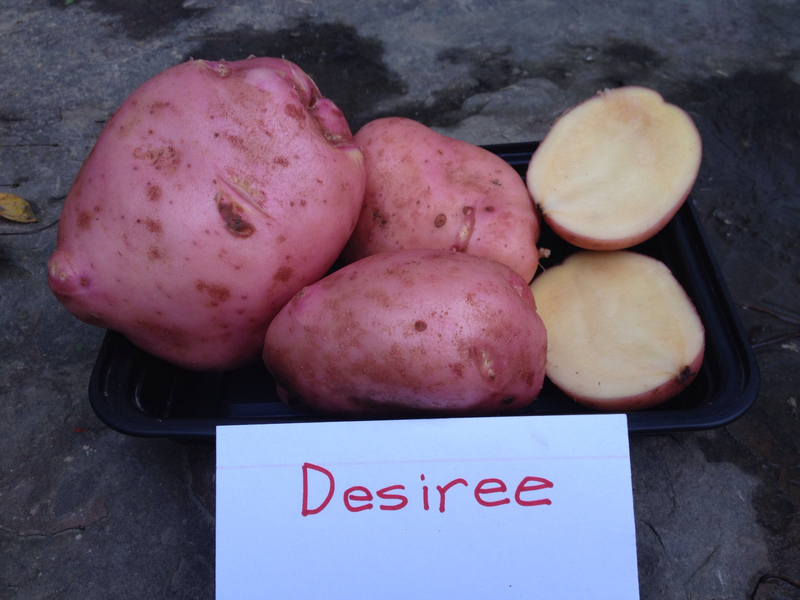 The following site have been useful in compiling the information about potato varieties. Most have photographs of the various varieties, as well. Photo of the giant potato by Paul Ievins.